God's will was that St. Paul visit Ephesus, so after a time he and Timothy started their journey to this metropolis of Asia. 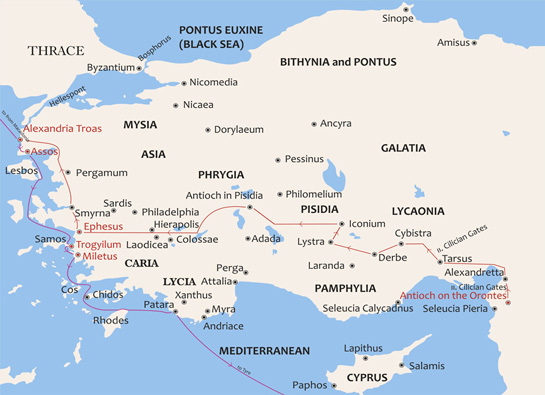 After visiting the churches in Galatia and Phrygia, they arrived at Ephesus via the upper road through the Cayster River valley. Ephesus was the fourth largest city in the Empire, boasting a population of perhaps 300,000 people. He rented the lecture hall of Tyrannus to preach and teach the gospel. In Romans 16:5 St. Paul sent greetings to Epenetus, his first convert in the province of Asia. The fruit of his two and a half year residency in Ephesus was that the entire province of Asia heard the word of the Lord (19:10).One of the seven wonders of the ancient world -the temple of Artemis- was located in Ephesus, and thousands of pilgrims and sightseers journeyed to Ephesus annually to worship the goddess at her temple. St. Paul's success, however, brought a reduction in traffic; hence the lucrative sale of Artemis images by the silversmiths was declined. The threat to their commercial interests provoked these merchants to take action, thus causing the riot described in Acts 19:23-41. St. Paul barely escaped from the city and headed up the coast, passing through Troas on the way to Macedonia. He also had problems in the Corinthian church (cf. 2 Cor. 2:12ff.) and was attempting to locate his emissary Titus, whom he had sent ahead. After a period of successful ministry in Macedonia and Achaia, St. Paul returned to Troas accompanied by at least eight of his associates (Acts 20:4 plus Luke). At Troas St. Paul raised the young Eutychus from the dead when he fell from the upper story of a Roman apartment house called a domus. The next day St. Paul walked over twenty miles to Assos where he met the others on board ship. Luke carefully plots the sea journey south through the Aegean Sea until the ship stopped at Miletos, a port city that boasted two harbors. There St. Paul summoned the Ephesian elders and delivered on the beach one of his most impassioned messages (20: 18-35). On his journey to Jerusalem St. Paul stopped at one more site in Turkey, the harbor at Patara (21:2). Patara became famous later as the birthplace of Nicholas, the patron saint of Christmas. St. Paul's third journey lasted from 53-56.